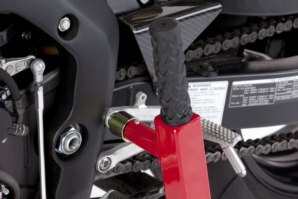 The Swing arm removal kit is a universal kit made to work in conjunction with the abba Superbike Stand & Sky Lift for removal of the Swing-Arm. 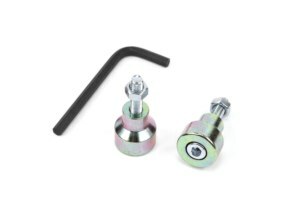 The kit works by removing your original foot rest hanger bolts on both sides of your bike, the swing arm removal kit then bolts directly to the bike frame in the foot rest hanger position with the bolts supplied (8mm thread). Once fitted the superbike stand/Sky lift will then locate on the swing arm removal kit. This will then give you full access to the swing arm pivot bolt so the swing-arm can be completely removed. When lifting in this way the whole bike can be disassembled down to the bare frame. This kit fits a vast range of motorcycles, all bikes with 8mm threaded foot rest hanger bolts. A seemingly impossible task of removing a motorcycle Swing-Arm is made safe and simple using this kit. Will work in conjunction with any abba Superbike Stand or Sky Lift new or old. Supplied with 8mm bolts ready to fit. Fits a vast range of motorcycles. Got this kit to remove the swingarm from my 2010 CBR1000RR, this removal kit bolts in with the footrests in place. This makes the job so much easier than removing the exhaust and using axle stands under the frame. Such a simple but effective design! Taking my time, I had the swingarm out within 30 mins. I had to remove the left footrest heel plate on the CBR1000rr to get the clearance to remove the swingarm with the footrests fitted. 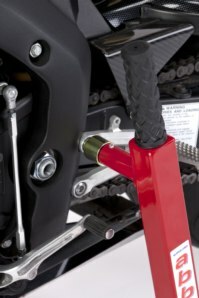 Will the Swing Arm Removal Kit fit my bike? 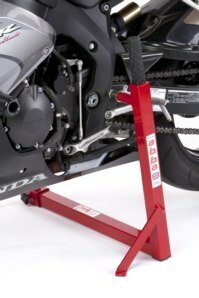 Can I fit the Swing Arm Removal Kit onto the Foot rest hanger, instead of removing the hanger and fitting to the frame? In some cases (as shown in pictures above on Honda Fireblade) the kit can be fitted directly on to the hanger itself. 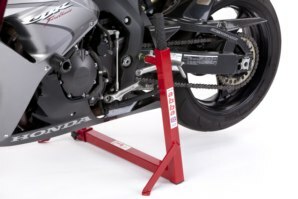 Once you have removed the hanger bolt from the bike offer the Swing Arm Removal Kit to the hanger and if it sits flush or inserts inside then it can be fixed to this point, otherwise remove or lower the hanger and fit directly to the frame. Can I use this kit all the time instead of using the abba Superbike Stand on the swing arm pivot? In theory yes, however we recommend this kit is only used for when you need to remove the Swing-Arm. Although this kit is still stable and secure, using the Superbike Stand on the Swing-Arm pivot with the correct fitting kit is a far better solution for constant use. Using this kit would also be much slower as you would have to fit and remove the kit each time you use the stand. Will I need to use the nuts included in the kit? If you are fitting the kit directly to the foot rest hanger mounts on the frame the nuts will not be required. Sometimes the nuts can be used (more information in question 5). Are there any other places on my bike the kit can be fitted? Got a Question about the abba Swing Arm Removal Kit? If you would like to ask us a question about the abba Swing Arm Removal Kit, simply fill in the form below and we will contact you within two working days. Want to tell a friend about the abba Swing Arm Removal Kit? Alternatively fill in the form below and we will send an email on your behalf to your friend, with a link to this page all about the abba Swing Arm Removal Kit.